I know no one knows this, but I have addictive tendencies (ðŸ˜‰). And when I get excited about something, I get excited...maybe even emotionally charged!! Well, I think I'm addicted to Swahili. I know we will have a love hate relationship later. But as for now I'm diving in and swimming. Talking with everyone I can find, practicing the same things until I get it, and teaching my family (as if I know what I'm talking about). Our gaurd William is quickly becoming a dear friend, but also my Swahili teacher. 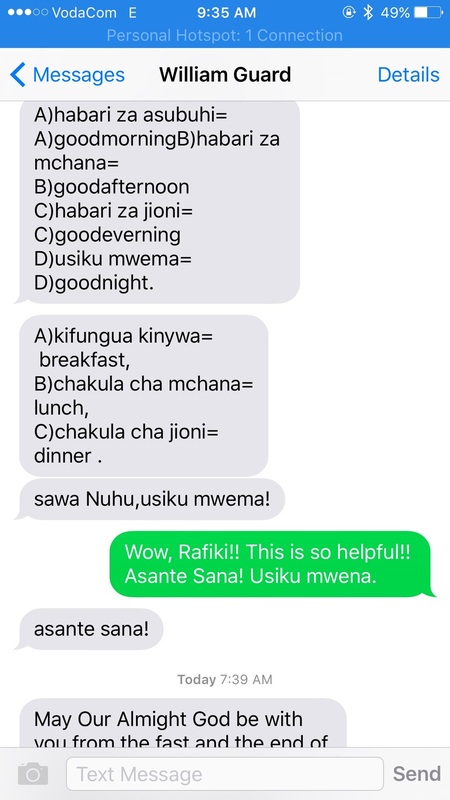 Each day he sends me an SMS with 5 new words in Swahili and English and then I practice them all day as I come and go. Our primary objective for the first year here in Tanzania is to learn Swahili. Period. Keeping this commitment will be our greatest challenge. Faltering on it will be our greatest temptation. Sadly, in our years on the field we've seen more missionaries fail at language learning than succeed. It's just hard! And wonderful opportunities (to find value when you feel low) come along and BOOM! Language learning is on the back burner. Our friend and colleague Joe (who is an American that speaks Swahili) wrote to me yesterday and I found his remarks so true: "Swahili speakers must be some of the best people in the world to learn language from. They are so patient and helpful... I predict that in 6 months or less you will feel reasonably comfortable - so by Christmas! After that it is gradually uphill. Don't feel bad if you don't keep up with the kids, especially if they are around other kids. With them, it will probably just click one day and off they go." Tucking this wisdom away and feeding on the encouragement. Let me inspire you with two of my language learning heroes right now. Our friends Jonathan and Sofia set out to learn one of the hardest languages on earth and did it! Watch this short clip!! I want to follow in their footsteps.